Faster, Better, Cheaper (FBC) was introduced at the beginning of the nineteen nineties and one of it’s early successes was the Pathfinder mission. Pathfinder managed to send back 2.3 billion bits of data including stunning images of Mars, it tripled it’s designed lifespan, delivered the Sojourner rover, sniffed rocks and saved Matt Daemon. These missions to the moon were primarily constrained by time. There was a space race with the Soviets who were, at this time, winning. So money was able to be provided and the scope could be opened up. Sure, “put a man on the moon” sounds like a pretty tight scope but there was so much that had to be learned to do that, so much that had to be developed, tested and better understood that actually, the focus was very broad for this endeavour. FBC was a change to that. NASA needed to reduce costs, deliver on tighter timescales and still maintain quality. To do this they had to narrow their scope. By increasing the focus of the missions they were able to plan missions that could meet the brief. Despite the problems they had in the late nineties FBC delivered the twin rovers Spirit and Opportunity to Mars. Possibly the most successful space mission to date‡. 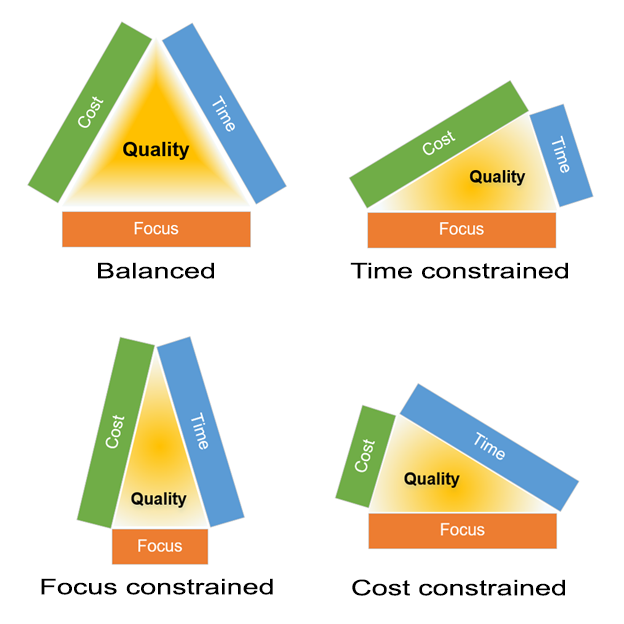 The graphics above show how flexing the three variables can limit or expand quality. Often when projects are incepted and requirements gathered the client wants it soon, cheap and with every bell and whistle attached. That’s fine, if they also don’t care if it works well, if at all (low quality). Similarly, as the project continues scope has a tendency to creep, yet there’s almost never a desire to push out delivery or spend more money (typically in the form of more resource). Having this triangle of project constraints to hand provides a language with which we can discuss the impact of changing any of them. Discuss how they interact to deliver the desired quality of deliverables. * A system provided a thrust reading in pound-seconds instead of the specified SI unit of newton-seconds meaning the craft’s trajectory would have taken the orbiter within 57 kilometres of the surface, where the spacecraft likely disintegrated because of atmospheric stresses. † In fairness, it did land but it shut off motors too soon and would have ‘landed’ too hard to survive. ‡ A three month mission to drive about and do science on Mars continues to this day, over thirteen years later!